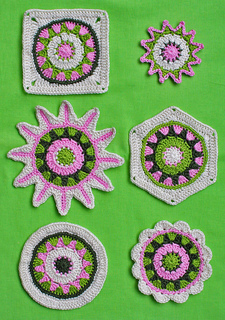 6 motifs - Granny Square, Hexagon to use for blankets, pillows, etc., 1 round and 3 floral motifs for decoration, as potholder, as coaster …..
You can use any kind of yarn to crochet this motifs. Size depending on the yarn and hook size you are using. Pattern includes 8 pages of directions. Please do not sell, redistribute or edit this pattern in any way.